Why Did The House Get Bluer And The Senate Get Redder? Before the election, we at FiveThirtyEight anticipated a sizable Democratic pickup in the House but a narrow GOP gain in the Senate … and that’s pretty much what happened.1 Currently, Democrats are poised for a net gain of 39 seats in the House, Republicans a net gain of two seats in the Senate.2 But as I pointed out before the election, it’s not unprecedented for the chambers to move in opposite directions (though it is a little unusual). The 2018 elections marked the fourth midterm since World War II that the president’s party lost ground in the House but gained in the Senate. *2018 data based on decided races and FiveThirtyEight’s analysis of unresolved races as of Nov. 15. Seat change calculated by how many seats the presidential party gained or lost based on the number of seats it held on Election Day. Seat vacancies were assigned to the previous party. Party switches after an election were not included in the calculations. What explains this split outcome, especially in such a Democratic-leaning national environment? First, the average competitive seat in the Senate was just a lot redder, and therefore harder for Democrats to pick up. And second, the number of seats each party had to defend differed pretty dramatically. The level of electoral exposure for each party, or how many seats had to be defended, also varied a lot between the two chambers. All 435 seats were up for grabs in the House, and the GOP held a 240-195 seat majority, so Republicans had more seats to defend. Democrats needed to pick up 23 seats to win a majority and looked to the suburbs and exurbs around major metropolitan areas for GOP-held seats, many of which flipped to give Democrats the bulk of their House gains. But in the Senate, Democrats were very much on the defensive. Of the 35 seats contested in 2018, 26 were held by Democrats,4 including 10 in states that President Trump carried in 2016 — five of which went for Trump by at least 18 percentage points. 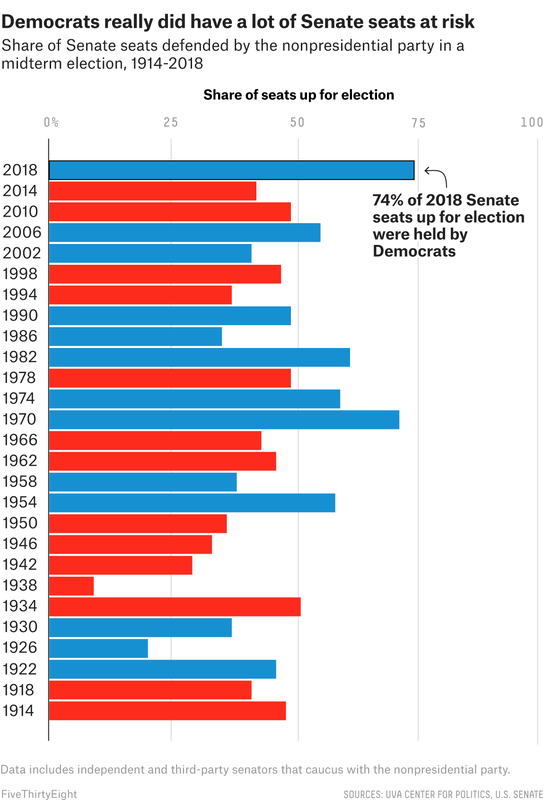 In midterm elections since 1914, this was the greatest number of Senate seats the nonpresidential party had ever had to defend. The election outcome of a divided Congress probably makes legislative gridlock the norm for the next two years. With an increased Republican Senate majority — probably 53 seats, though the recount in Florida and the runoff in Mississippi’s special election could change the calculus — the GOP leadership won’t have to worry as much about a breakaway caucus tanking votes. This will help Republicans confirm judicial appointments, but it could also make finding compromise on legislative matters with a Democratic-controlled House even more difficult. There are still a number of uncalled races, and seat totals are not yet final in either chamber, though majority control is set in both. According to ABC News projections and FiveThirtyEight’s analysis of the unresolved races. These calculations were weighted by a state or district’s likelihood of being decisive in determining a chamber’s majority according to FiveThirtyEight’s tipping-point index. They used FiveThirtyEight’s partisan lean metric, which is the average difference between how a state votes and how the country votes overall. 2016 presidential election results are weighted 50 percent, 2012 presidential election results are weighted 25 percent, and results from elections for the state legislature are weighted 25 percent. Including two independents who caucus with Democrats.